Want to start to fall madly in love with your life again? Team S.H.I.N.E. is excited to introduce the founder of S.H.I.N.E. 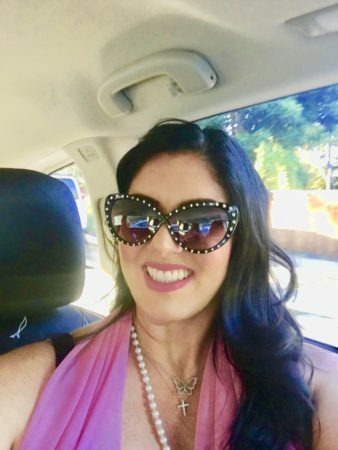 and Empowerment Coach, Speaker, and Award Winning Author of The Magical Guide to Bliss Meg Nocero of Butterflies & Bliss, LLC, The Meg Nocero Network and You Tube Manifesting with Meg Show. Meg Nocero remembers thinking how easy it is to get stuck in life, far short of where she wanted to be; and whether you feel trapped by tedium or pain, it’s hard to keep from despairing that this is all there is and that bliss is just a myth. Yet, Oprah’s “Live the Life You Want 2014” came to Miami and catapulted Meg to take the final step and truly live the life she wanted. One of her long time dreams was to meet Oprah and she was one of the lucky ones to get called up on stage with Oprah in Miami and as they say, the rest is history; in this case, it’s a book, The Magical Guide to Bliss and a non profit S.H.I.N.E. Miami-S.H.I.N.E. Networking Event, Inc.
“I will never forget Oprah looking me in the eyes saying to me “this is your moment Meg, don’t miss it, it is time to live the life you want!” And so I have!” said Meg recounting about her journey to finish the book she had begun after her mother’s passing. Meg is a former Department of Homeland Security attorney. After 19 years of federal government service, she resigned to pursue her dream as a writer, inspirational speaker, a success coach, and attorney for justice. The Magical Guide to Bliss was her first book, one that she began writing to help her navigate through the grieving process after the devastating passing of her mother from breast cancer in April of 2011. Choosing to move out of the darkness, Meg embraced a journey with this guide where she rediscovered her inner light. Her trilogy called The Sunrise of My Soul’s Bliss also includes her memoir Beautiful Butterfly and magical mantra handbook Sparkle & Shine in progress. BUTTERFLIES & BLISS LLC AND S.H.I.N.E. After mentoring hundreds of colleagues with professional development, she expanded her circle of influence. In addition to launching Butterflies & Bliss, LLC and her blog on The Meg Nocero Network at www.megnocero.com, she founded S.H.I.N.E. Networking Inc. to honor the legacy of her mother. Her team hosts this event that re-energizes the community, inspires hope and provides educational scholarships to empower the next generation. Nocero founded the Give Love Project with her children to teach the importance of giving love. She is an Ambassador for The Love Button Global Movement. Santiago. That spiritual journey gave her the inspiration to finish her book Beautiful Butterfly. The world is full of wonders and ripe with possibility. Are you ready to take hold of your share? Bliss is within your reach. Let’s do this!